Elka barely remembers a time before she knew Trapper. She was just seven years old, wandering lost and hungry in the wilderness, when the solitary hunter took her in. In the years since then, he’s taught her how to survive in this desolate land where civilization has been destroyed and men are at the mercy of the elements and each other. Beth Lewis is a managing editor at Titan Books in London. She was raised in the wilds of Cornwall and split her childhood between books and the beach. She has traveled extensively throughout the world and has had close encounters with black bears, killer whales, and great white sharks. She has been a bank cashier, a fire performer, and a juggler. "A white-knuckle trip through a gritty, frightening, and all-too-plausible post-apocalypse. You won't know whether to root for or be afraid of heroine Elka, and you won't be able to put the book down." "A remarkable first novel that drew me in from page one. I was reminded of the beautiful savagery of Cormac McCarthy's The Road and the elegiac overtones of Dickey's Deliverance while reading—but Lewis has crafted something completely unique here, carried so powerfully along by the voice of its indelible young narrator." "Addictive and compelling..an apocalyptic thriller with a dark, horrible heart. It's impossible not to root for Elka as she fights her way through a chilling -- but disturbingly familiar -- wasteland. " 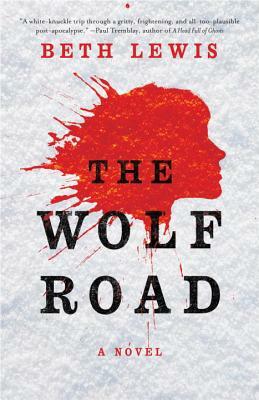 "Stark and soulful, The Wolf Road is a brutal yet poignant journey into the truth of one girl's origins in a shattered wilderness. It masterfully dances between the savagery of the wild and the raw, blunt humor of frontier logic. A rollicking, striking read."